The gallo romans created vineyards in the Garonne valley in the second century. Some remains of their villas and mosaics can still be seen. During the Middle Ages, as the river could be forded, it became a stopover for pilgrims on their way to Santiago de Compostella. 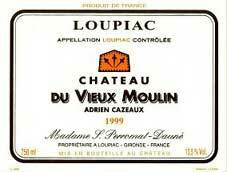 In the 18th century, rich Bordeaux families settled there, the wine of Loupiac has long been renowned. Loupiac wine is only produced on hillside vineyards, planted on slopes with chalky-clay and sandy soils and a southern exposure, on the right bank of the Garonne facing the Sauternes vineyards. As in Cérons, on the other bank of the river, morning mists favour the growth of Botrytis Cynerea , the famous "noble rot". The property belonged to Mrs Suzanne Perromat's family: the Cazeaux family settled in Loupiac before the 15th century. They were mayors of the district from 1881 until 1929. This direct inheritance is quite exceptional. Chateau du Vieux Moulin owes its name to an old windmill which, for centuries, stood on the highest point in Loupiac.